Adaias Souza, chief executive of the Brasil Insurance Agency, is releasing information on a new charity drive in the Somerville region to help provide healthy food to hungry families and individuals in the region. 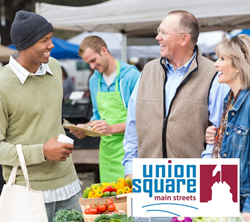 Donations gathered will be used to support the Union Square Main Street Farmer’s Market program. "Our agency believes that by coming together, our community can tackle the food insecurity problems faced by a growing number of local families,” said Souza. The firm is asking residents to get involved in the charity drive and help generate donations by sending in referrals for no cost insurance quotes. For each referral received by Brasil Insurance, the agency will make a cash donation to the Union Square program. More information on how to get involved is available here: http://brasilins.com/rewards/. As a Personal Finance Representative in Somerville, agency owner Adaias Souza knows many local families. His knowledge and understanding of the people in his community ensures that clients of Brasil Insurance Agency are provided with an outstanding level of service. Adaias and his team look forward to helping families protect the things that are most important – family, home, car and more. Brasil Insurance Agency also offers clients a preparation strategy for achieving their financial goals. To contact an expert at Brasil Insurance Agency, visit http://brasilins.com/ or call (617) 623-7966.